We’ve done a lot of driving already this year and my holidays only started a week ago. Two more weeks and we’re both on holidays. In preparation, I just replaced our tattered Newfoundland and Labrador map. There was a large music festival in Grand Falls-Windsor so we knew we weren’t going that far west. Salmon Fest was more traffic and people than we were interested in. 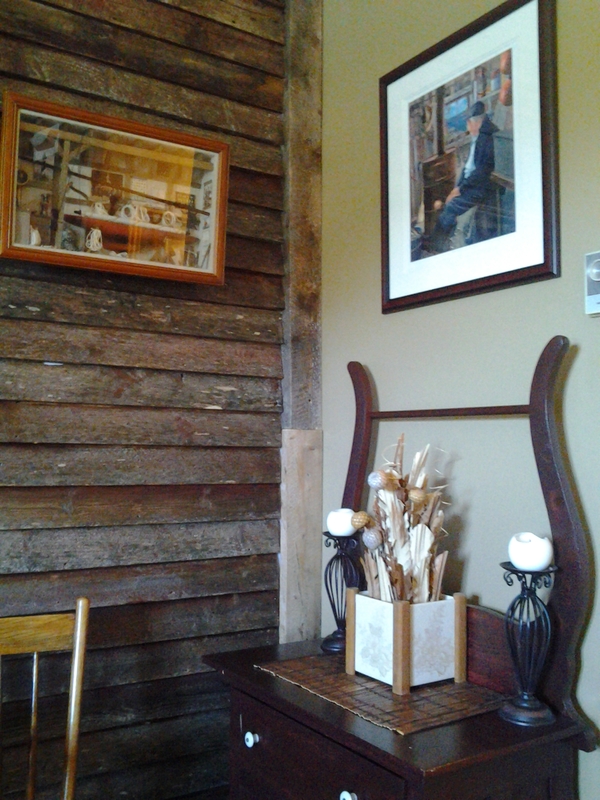 Over the first coffee, while still in bed, we talked about making a day trip to Lewisporte for a visit with friends and a walk through the Rossy store. 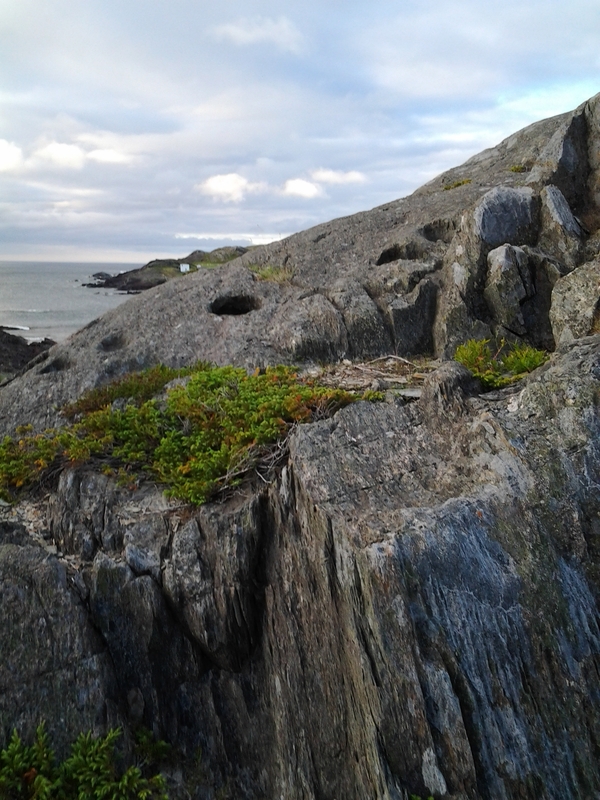 By breakfast at the Bread Box we were wondering if there were icebergs around Bonavista. As we were home brushing our teeth, the thought struck that maybe we should throw a bag of clothes in the car, just in case. As I gathered the gear, Leo went for gas. Esso is loving us these days. 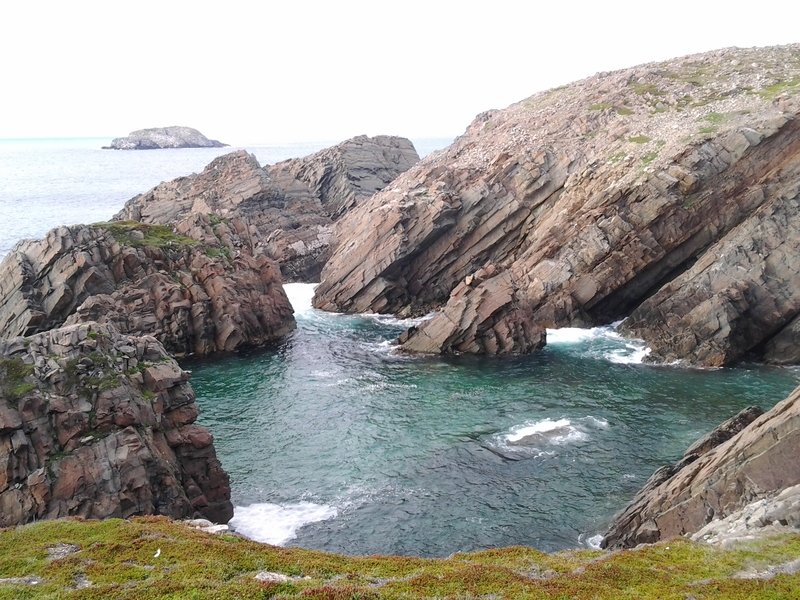 We were on the road before noon and decided to do the Cove route towards Bonavista by taking route 235. I had seen an Inn on Facebook that I wanted to check out for future trips. Our first stop and detour was to Summerville. 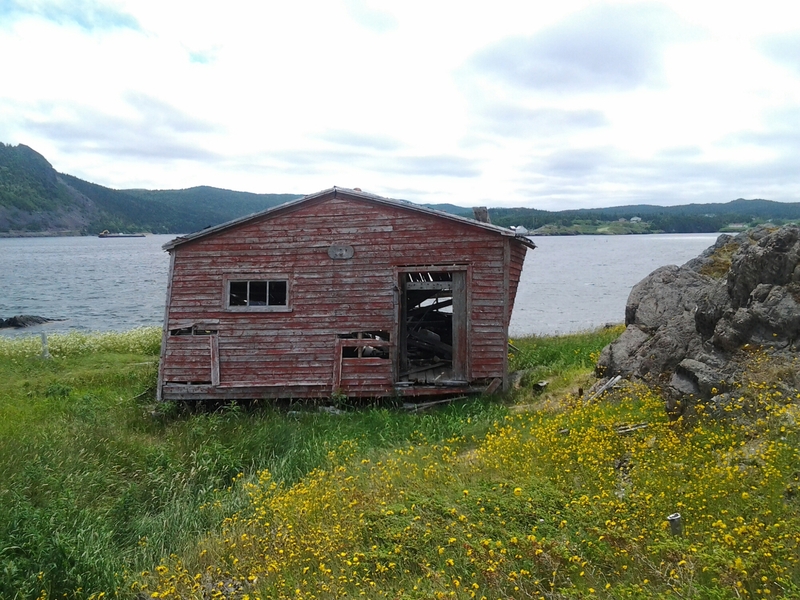 A beautiful little outport, Summerville had a combination of old and some new houses with the bungalows mixed in. 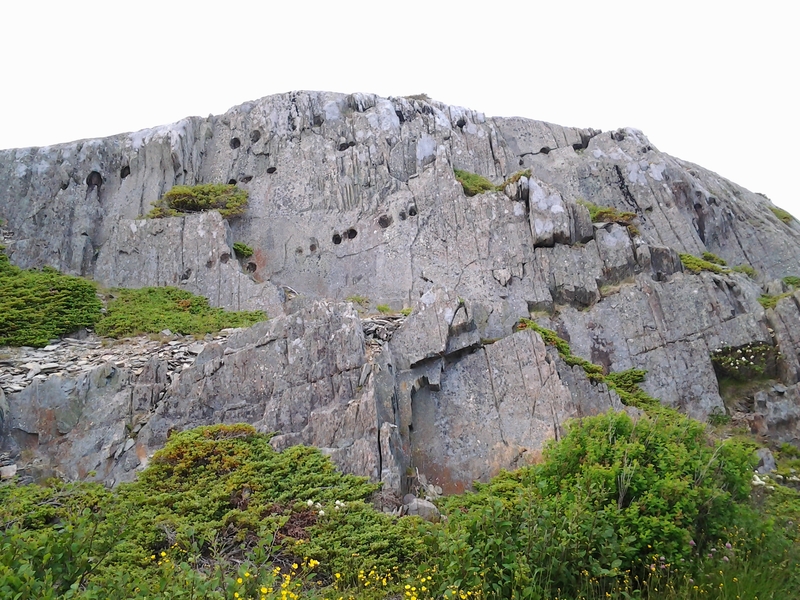 Summerville, NL Leo was more observant and noticed three blasting holes in this large rock. 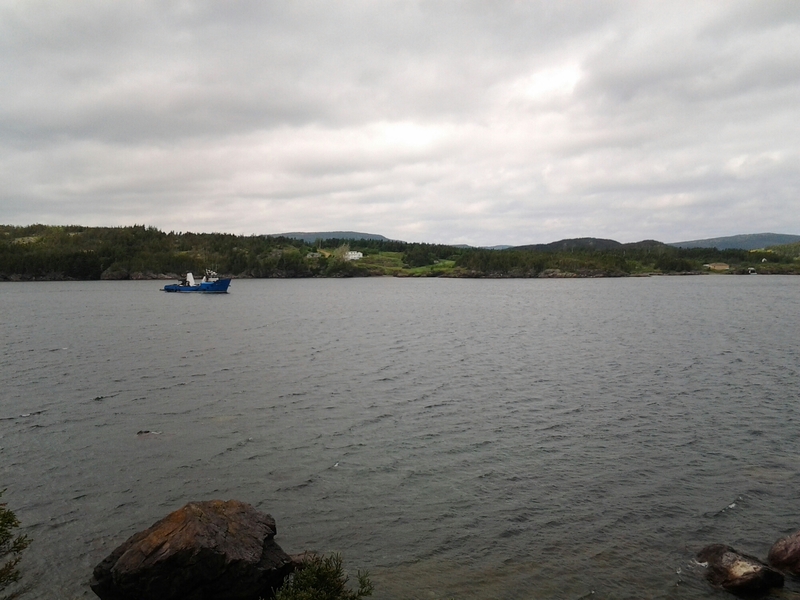 There was some action around the wharf and we watched for signs of capelin on the beaches. No luck but a lovely breeze on the water today. 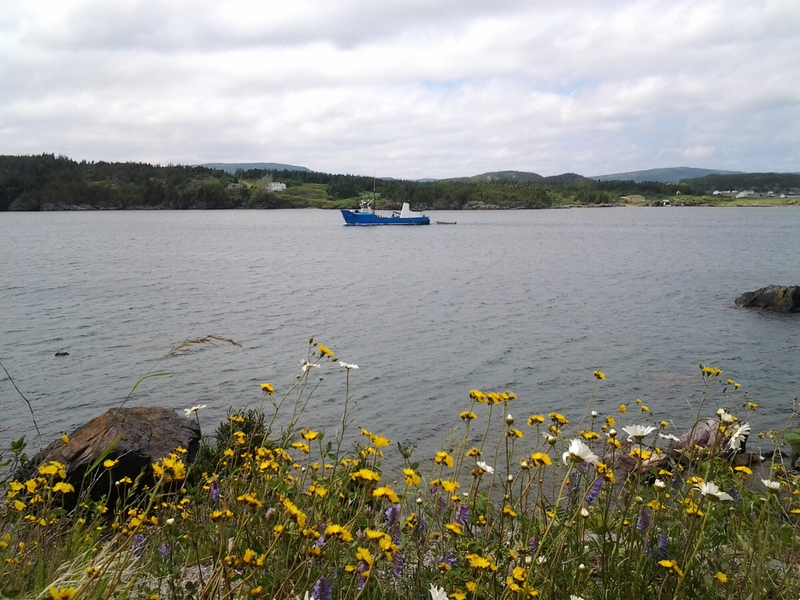 Back on the highway we saw a large boat that seemed to be looking for capelin so we pulled over to watch it. 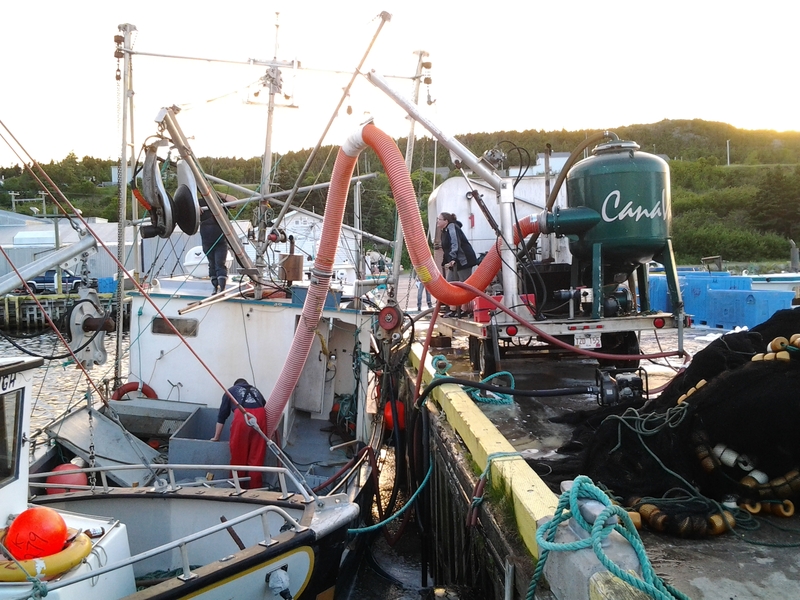 I’ve never seen the capelin roll but we know they are around and rolling in some areas. This was across the harbour from our previous stop in Summerville. Leo’s not particular about where he parks the car. Note this was about a 75 degree incline. With binoculars, we realized the Green Waters was carrying a film crew. 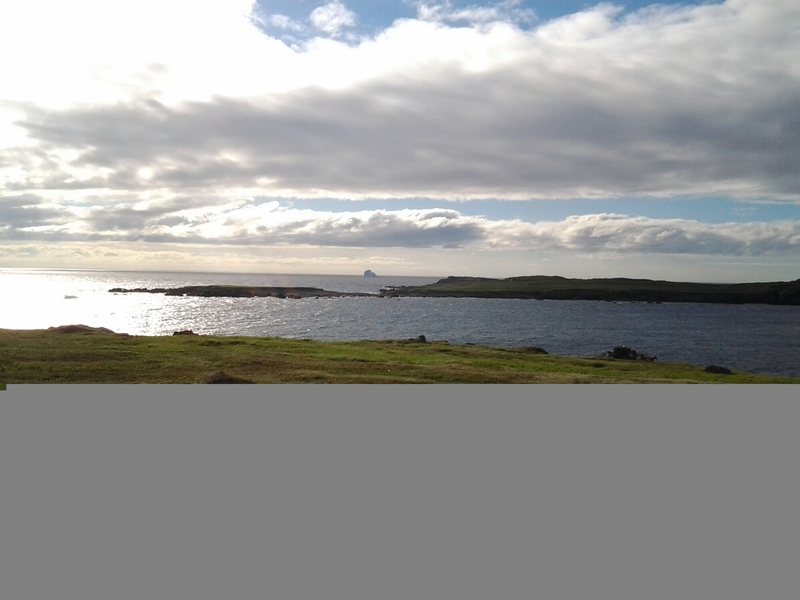 We watched it circle for a bit but with no sign of fishing, we finally moved on towards the two icebergs on the horizon. 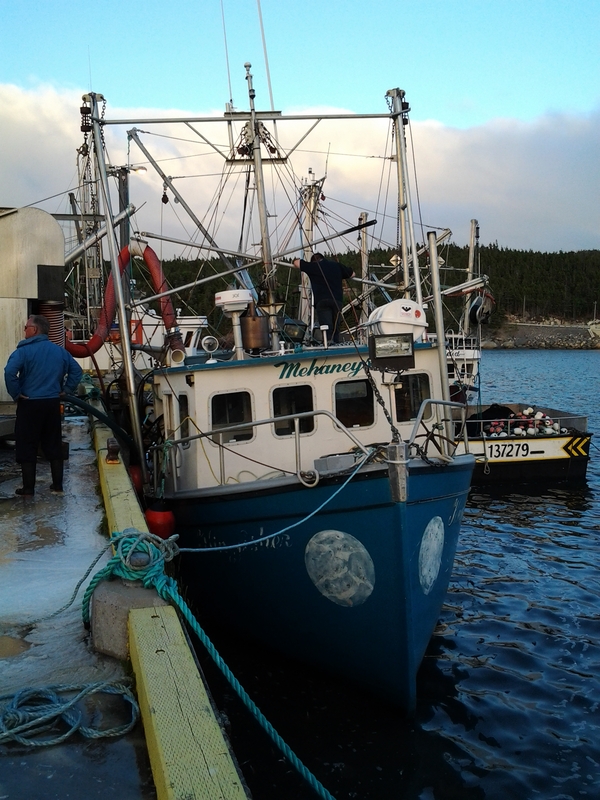 Plate Cove West had boats fishing and we just caught the tail end of one boat putting out her sein. I’ve learned a lot about fishing techniques from Richard Gillett and the Cold Water Cowboys show. Let ‘er go, let ‘er go, let ‘er go! 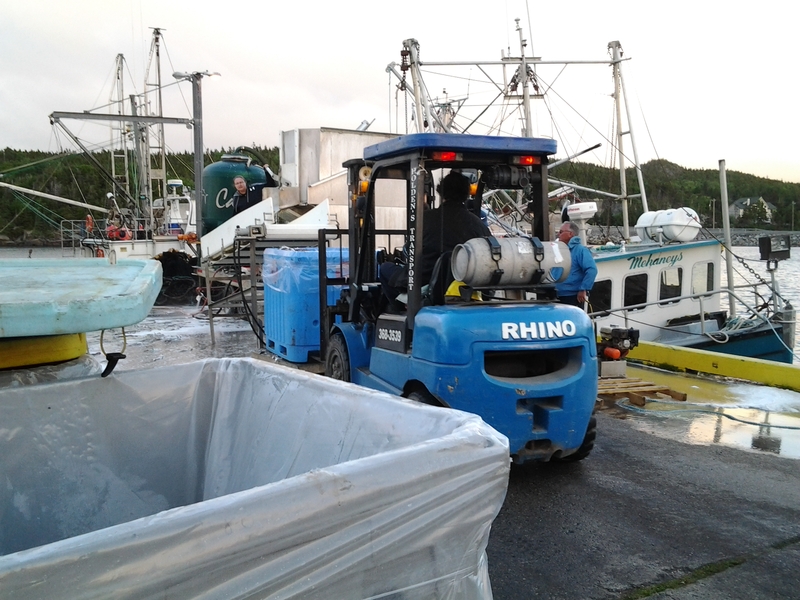 The distance was beyond my tablet but with the binoculars we could see the fish being lifted aboard. No camera crews on this one but lots of heavy work and technique, even from the shore. 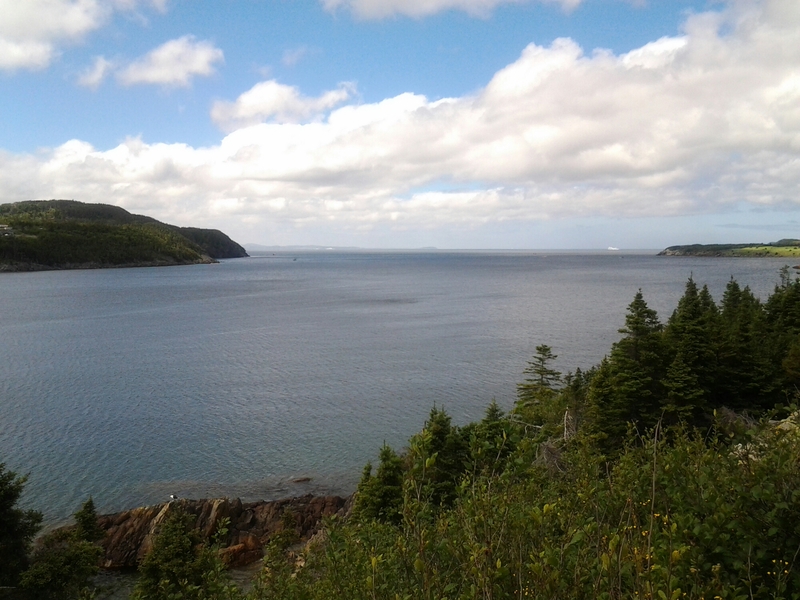 Again, no signs of whales or capelin rolling but we knew they were around but there were two icebergs still on the distant horizon. Round Da Bay Inn has a great Facebook page and ran a contest recently which is where I became aware of them. 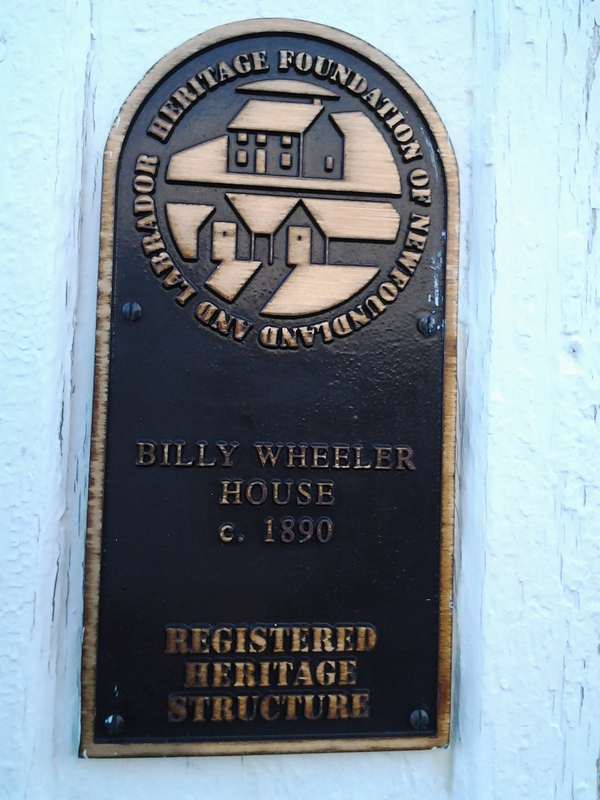 Their web site is extremely well done and promotes not just the lovely looking inn, but also the many attractions in the Trinity and Bonavista areas. 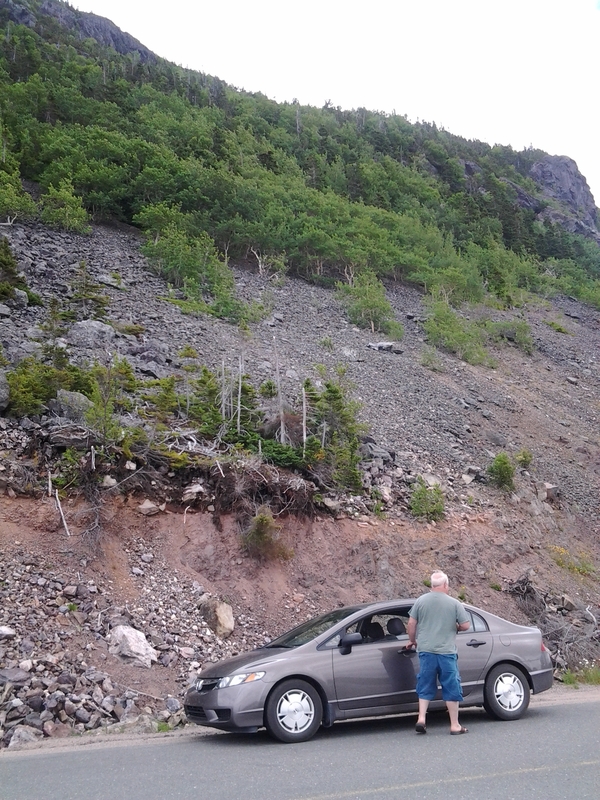 There were no signs on the road to guide us but we found it easily in Plate Cove West. The Inn’s grounds are still a work in progress but the beautiful sign and newly restored building are welcoming as were the number of vehicles there mid-afternoon. Lots of traffic always indicated lots of customers, often regulars who know this is a good spot. I knew from their web page that they had a restaurant so we went in for a late lunch. Although they posted that the dining room closed from 2:30 to 5:00 we were eagerly welcomed at 2:00 and a full menu was presented. We picked hot hamburger sandwiches and had a choice of white or whole wheat homemade bread. While Leo checked out a brew, I left the lovely dining room to explore the art gallery in a room across the hall. 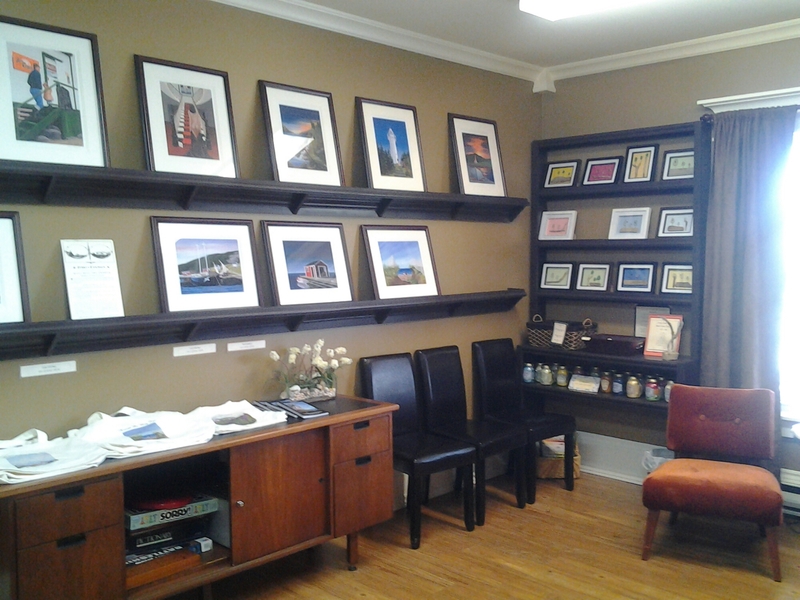 The owners, Chris and Karen each have work displayed here. Chris sells prints of his paintings and Karen has a lovely series of sea glass art. Using found glass, drift wood and adding features she does whimsical works that are ideal baby gifts or little souvenirs representing a family of three birds in various situations. Both are very talented but again, the gallery was there to see, not a hard sell by any means. I actually had to ask if they were the artists! This is a beautifully renovated and decorated property. Appreciating how nice it was and that it was already mid-afternoon, we decided we’d base booking a room on lunch and the rate we were offered if it was a good lunch. If we booked a room, we could slow down a bit for the day. 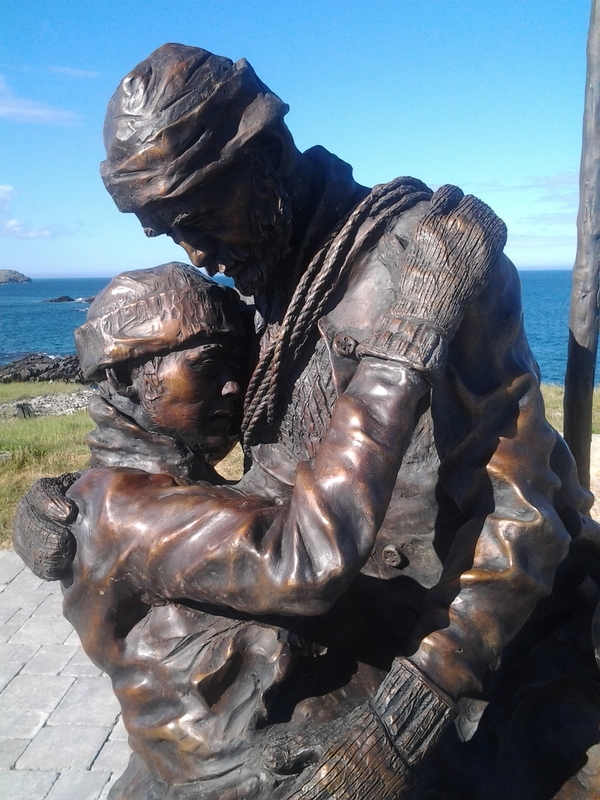 A quick check in of Facebook gave me a message from my friend Linda who suggested the Sealers Memorial if we were indeed headed to Bonavista area was I’d indicated as a possibility earlier in the day. She had been there eariler and her grandfather was a survivor of the SS Newfoundland disaster. Thanks Linda! The trip suddenly had a goal. I’ve been wanting to see this since I heard about it being built. 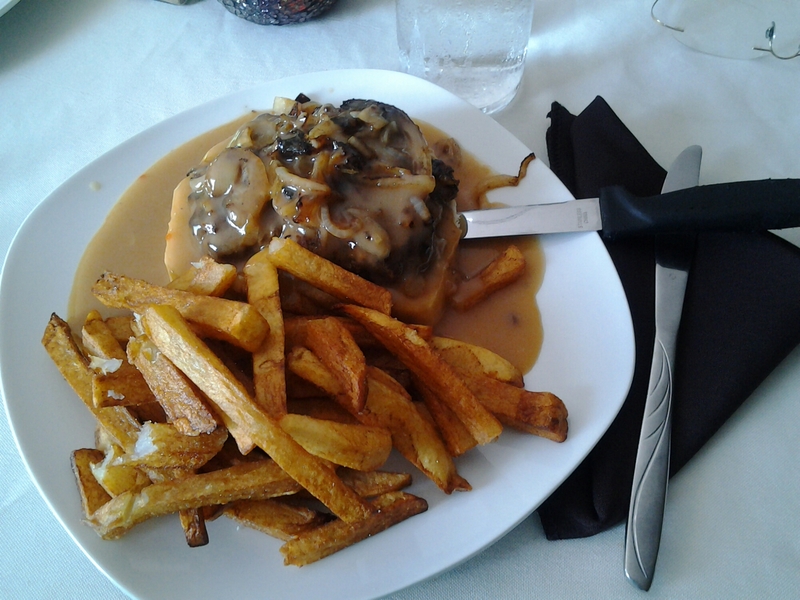 Lunch was great, as was the attention from owners Chris and Karen. They’d had 40 guests the night before and were very busy, but not too busy to stop, speak and check in frequently. 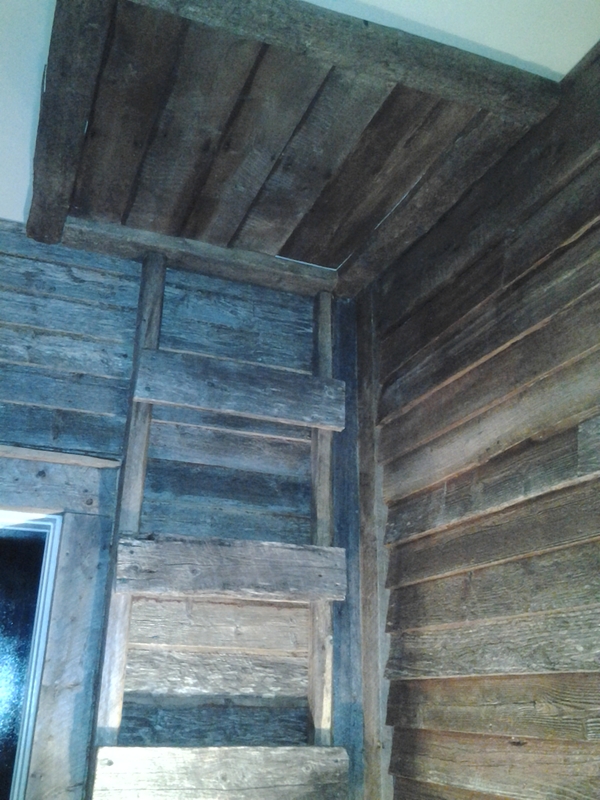 Chris encouraged us to look at any of the vacant rooms before we left. If the door was open, the room was available for the night. There was no sales pitch, just a proud proprietor wanting to show off his property while we were there. 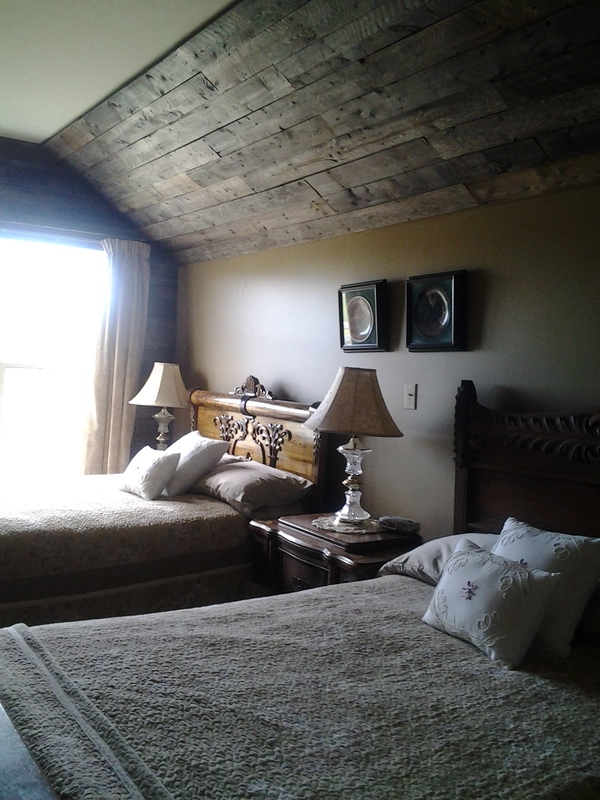 Each room is tastefully decorated with it’s own unique theme. 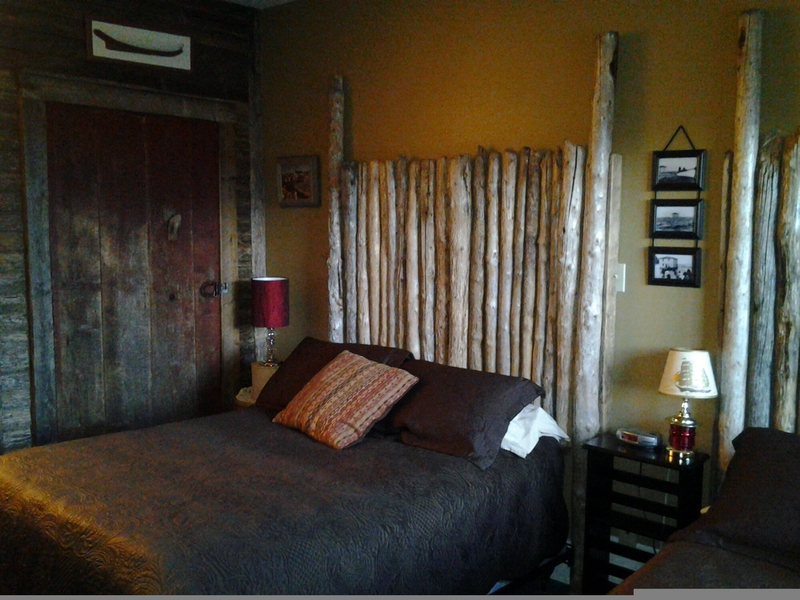 Fun but not overdone, this reminded me of Toronto’s Gladstone Hotel with it’s designer rooms. Each room felt like a getaway. It didn’t take looking at too many rooms to know we were booking for the night. We did have to do a second look before picking The Stagehead as our lodging preference. 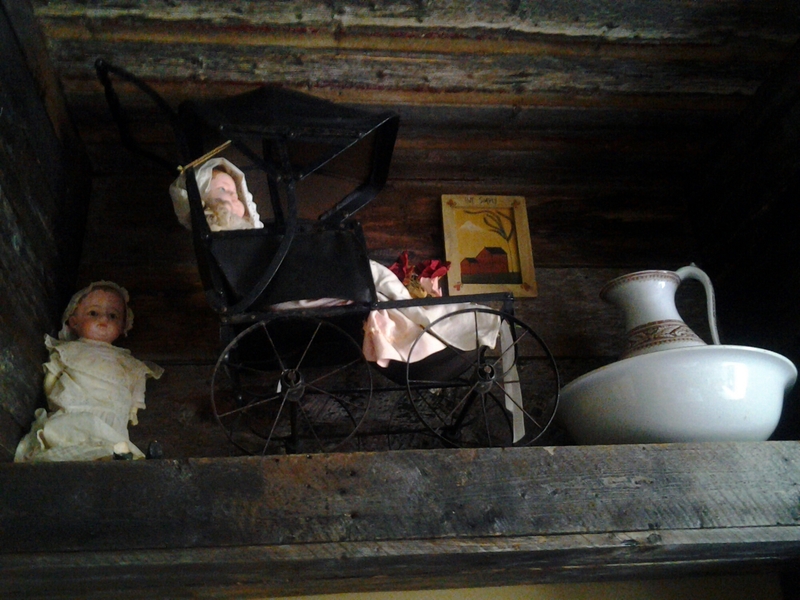 Nan’s Attic would have been my second choice, just based on the coziness factor. 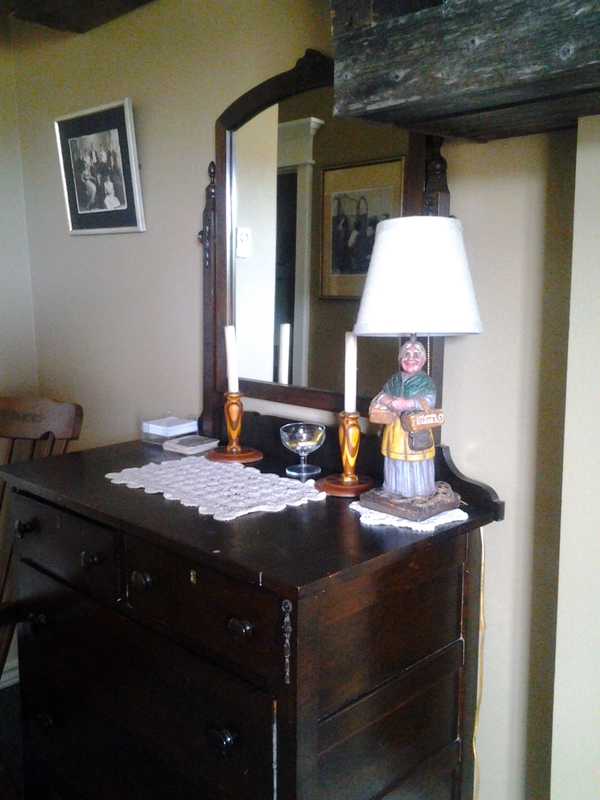 Both had a kitchenette as all the rooms facing the road are efficiency units with private entrances or access through the hall. 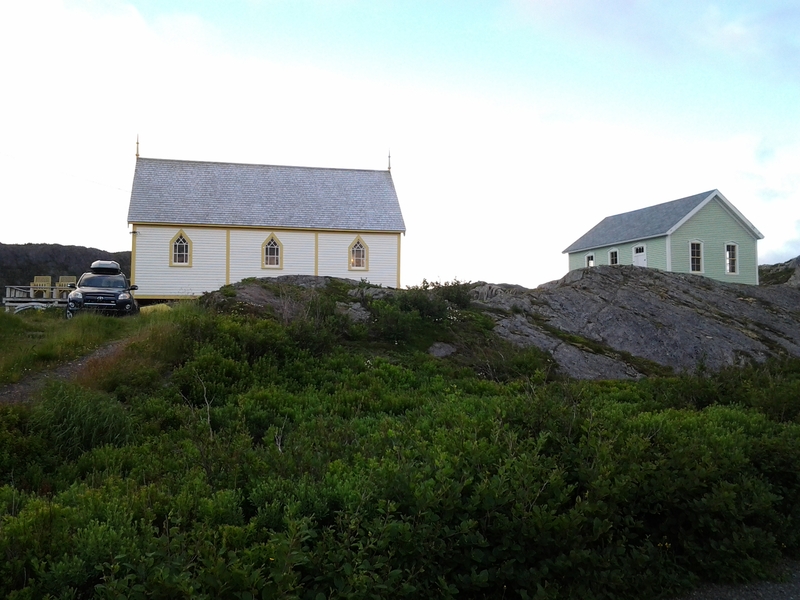 With a room and a destination and having chatted too much with Chris, we realized we needed to beeline for Elliston to make sure we caught the museum before it closed. Elliston is the Root Cellar Capital of the World. It’s home to a great food event called the Roots, Rants and Roars. 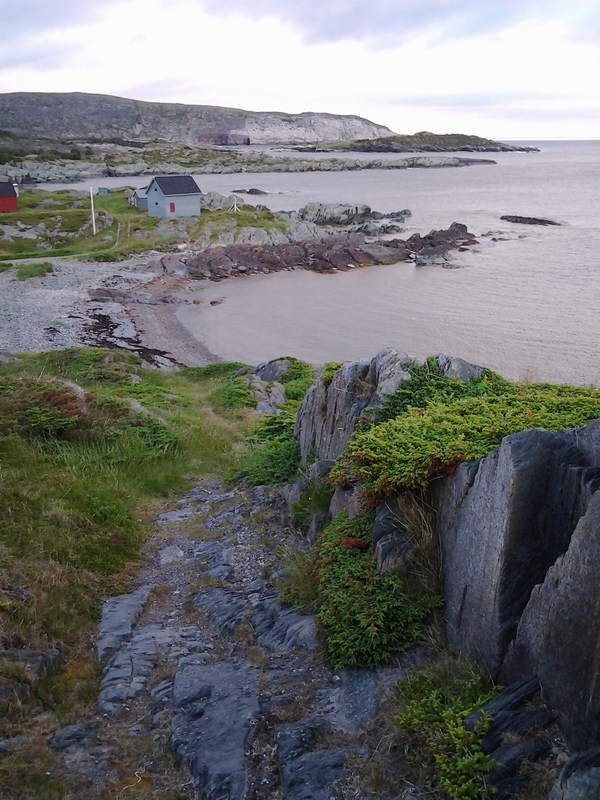 It’s also an area that features islands where puffins nest and whales circle to feed on capelin and it is now home of the recently opened Home from the Sea John C. Crosbie Sealers Interpretation Centre. I taught Cassie Brown’s book, Death on the Ice as part of my practicum before getting my teaching degree. 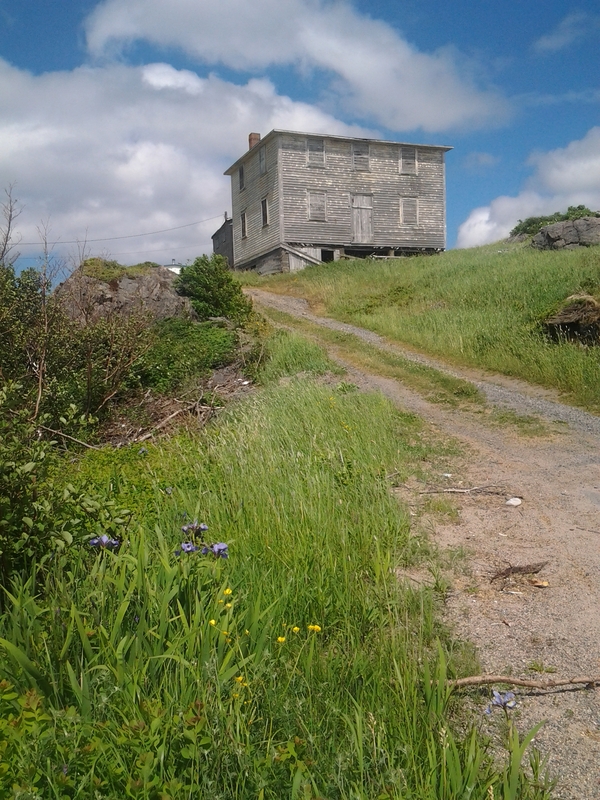 At the time, I didn’t dream I would be teaching in Newfoundland the following year and the 26 after that to date. This historical tragedy recounts the details of the Newfoundland sealing disaster. The SS Newfoundland was a vessel that lost most of its crew in a storm in 1914. 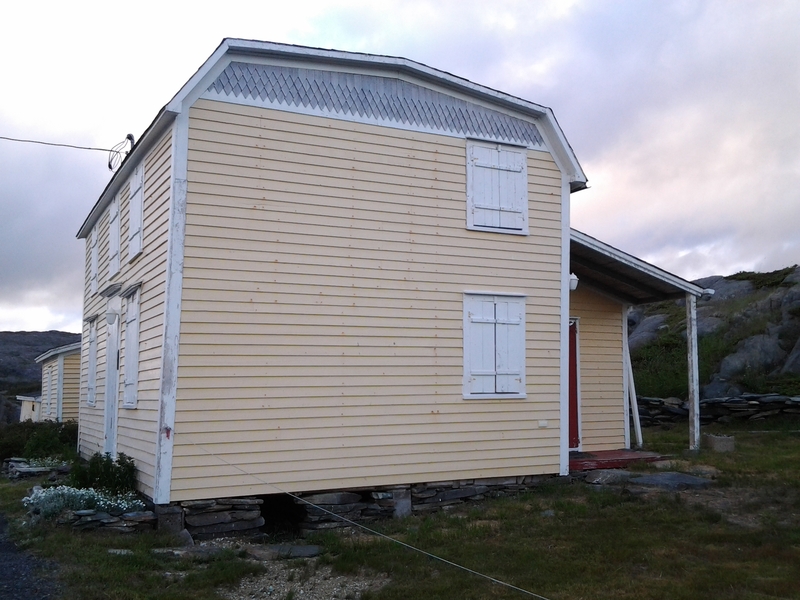 The Home from the Sea projects commemorates the disaster and educates about the history, culture and tradition of the sealing industry. 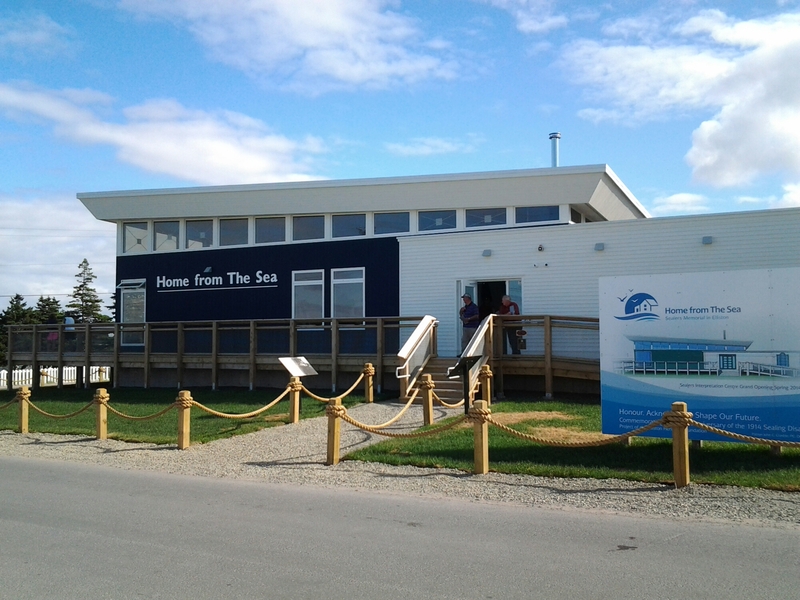 The exhibition hall has artifacts, documents and panel boards explaining the history and economic importance of this fishery and the hardships it brought. On panel taught that, at one time, the lamps of London were fueled by seal oil. A display case showed tools and equipment used on the ice. Photographs, video and audio interviews provided authentic information as experienced on the ice. An audio recount from a survivor reminded me of stories told by the late Don Decker from Joe Batts Arm. Don talked about going on the boats to Labrador and sleeping in mattress with wood shaving stuffing. He said there were 3 shavings to a mattress. The sealer talked about 3 men to a berth and three men in the berth above you on these mattresses. Mixed with these items were various paintings, poems and quotes from literature. Ben J. Ploughman from Port aux Choix was one artist who donated a work. 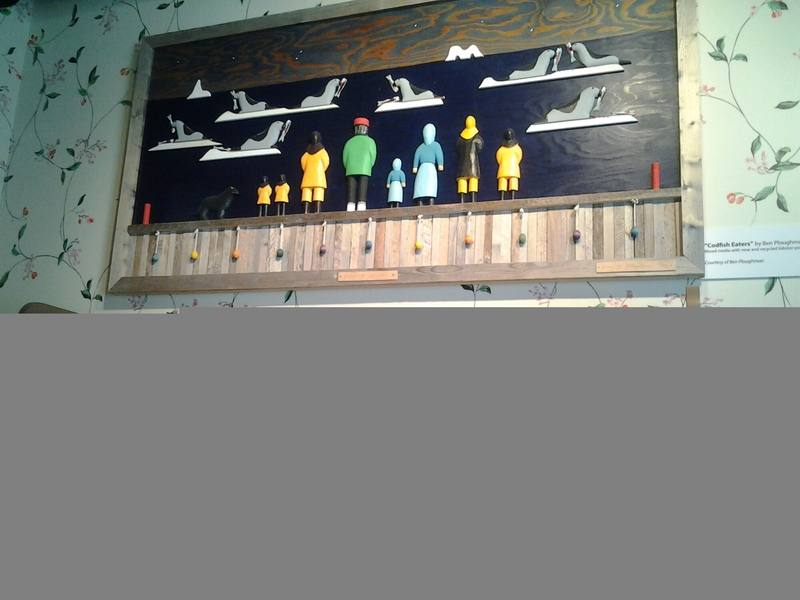 Ben’s not afraid to represent his political views in his work and this piece shows fishermen at a time when it is illegal to fish cod, watching the seals eating it. 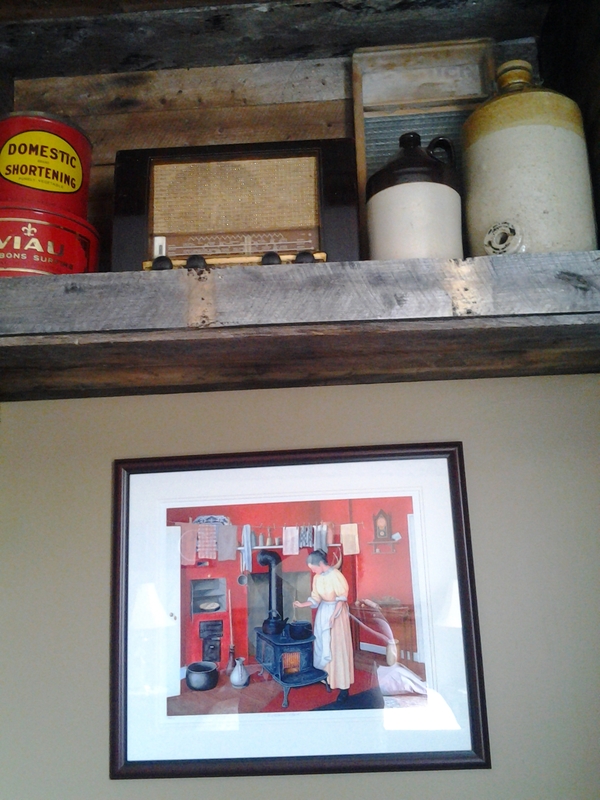 I love Ben’s style and proudly hang one of his resettlement pictures in my living room. I mentioned the Southern Cross in a previous post. 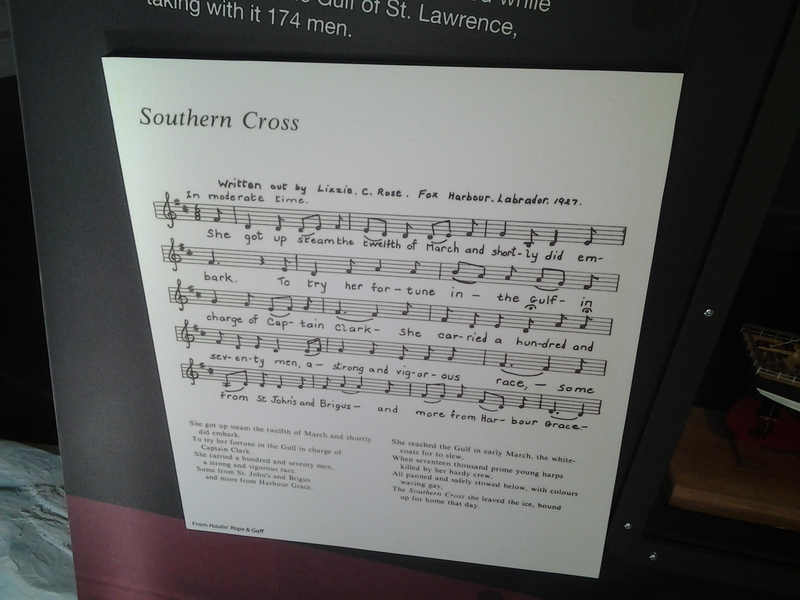 On the same date as the SS Newfoundland disaster in 1914, in the same storm, the Southern Cross was lost with all hands. This song is a beautiful ballad remembering the event from a hundred years ago. 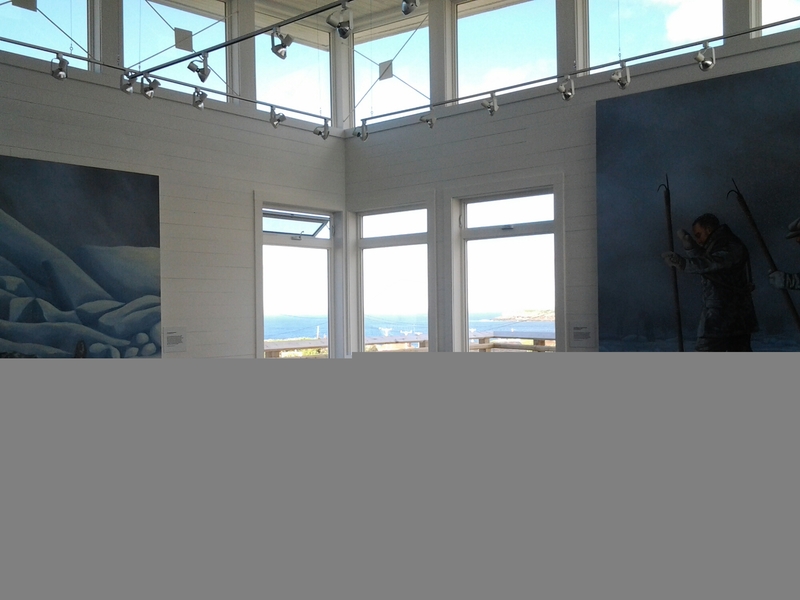 A stunning art gallery faces the ocean on the other end of the Interpretation Centre. 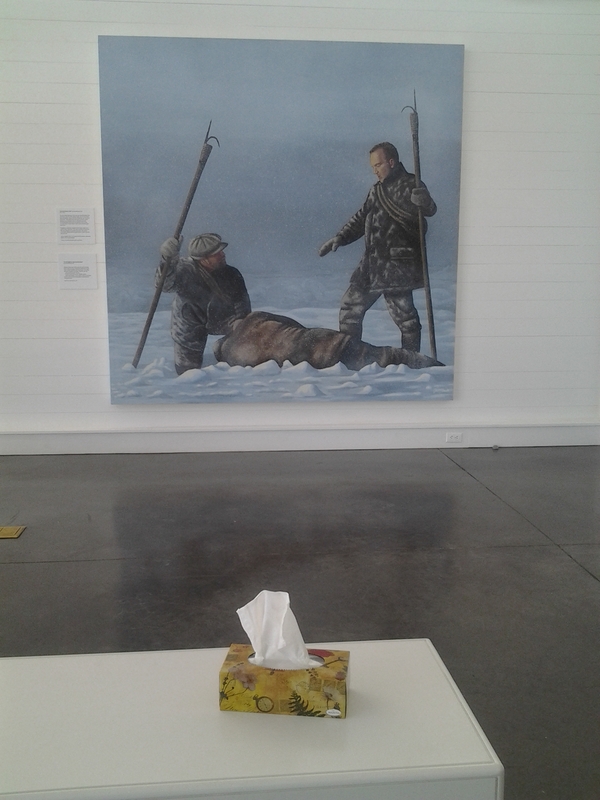 Huge paintings by John McDonald portray the sealers lost on the ice. With text from Cassie Brown’s book, one can not help but be flooded with emotion realizing this represents the ordeal that ended with so many deaths. Tissues are provided with reason. 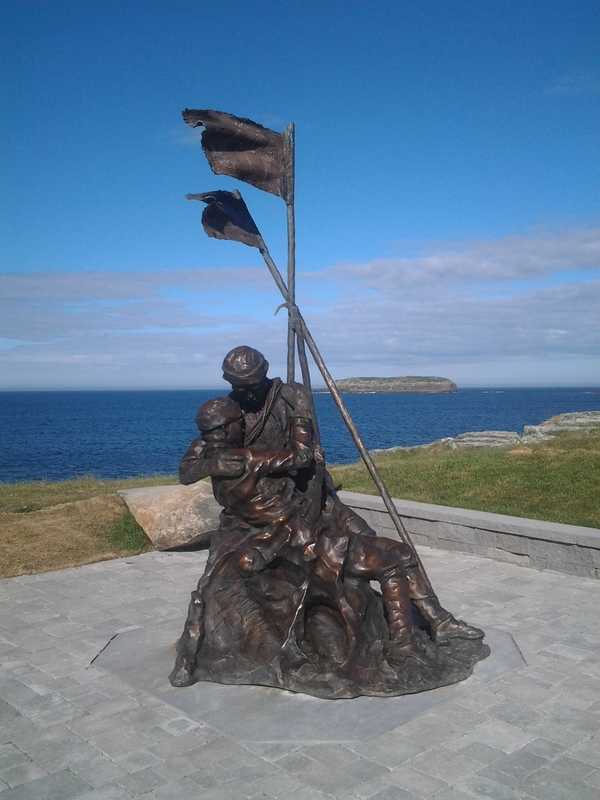 From the gallery we drove to the Sealers Memorial Statue and Monument erected on the point. The names of those lost on the Southern Cross are on one side. 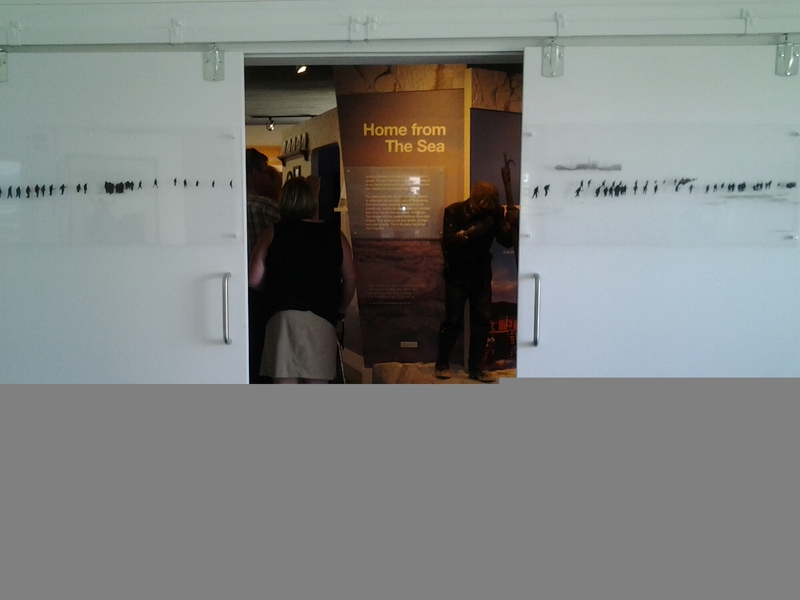 The victims and survivors of the Sealing Disaster are listed on the opposite side. 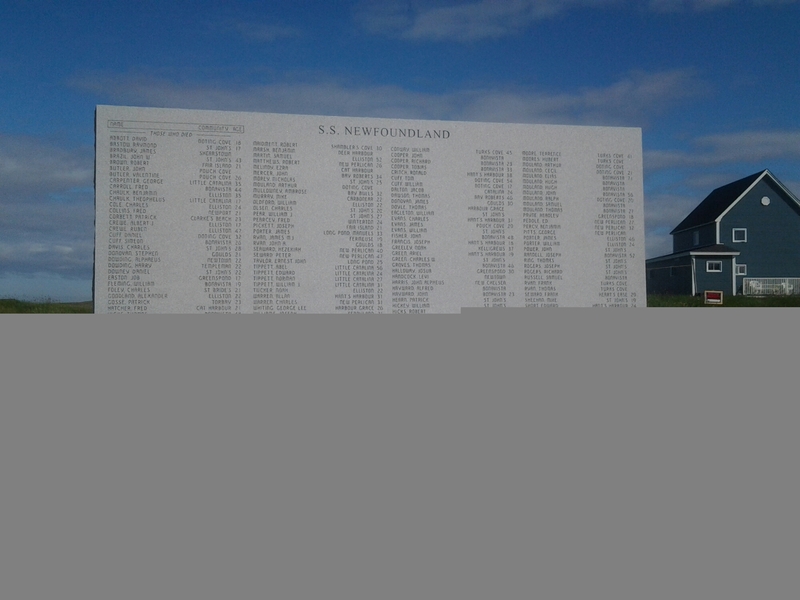 Survivors, like the families of victims were forever affected by the loss of 254 Newfoundlanders. This father and son were found on the ice frozen in this pose. Reuban and John Albert Crewe Statue by Morgan MacDonald. 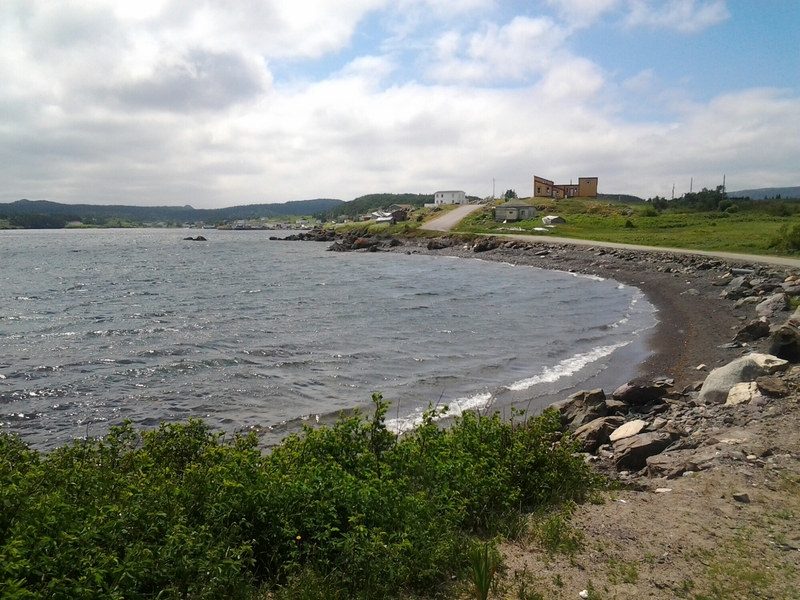 Elliston, NL In memory of 254 souls lost. There were a number of tourists around. Some for the whales and puffins, others for the memorial. We had a great chat with some visitors from Ontario, who were home for a holiday. 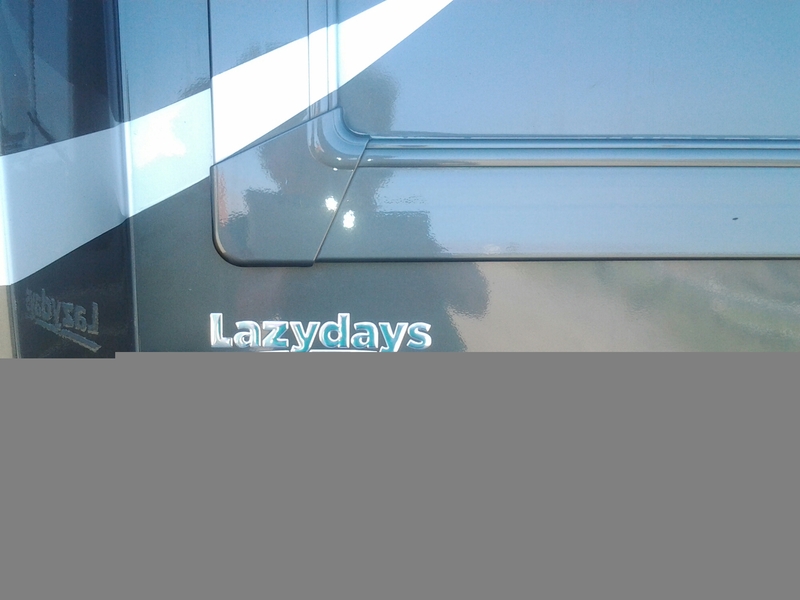 Traveling in a motor home they too enjoy Lazydays touring around Newfoundland and Labrador. 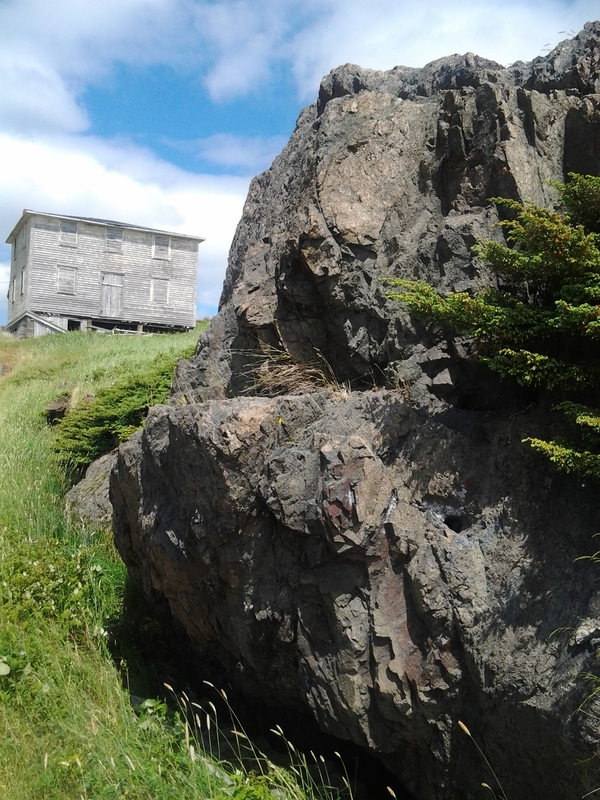 We spent an hour or more in Elliston and then did a tour to the Cape Bonavista lighthouse to check for ice. In a normal season, seeing 3 or 4 icebergs, even at a distance would be considered great success but we’ve been so spoiled this year. 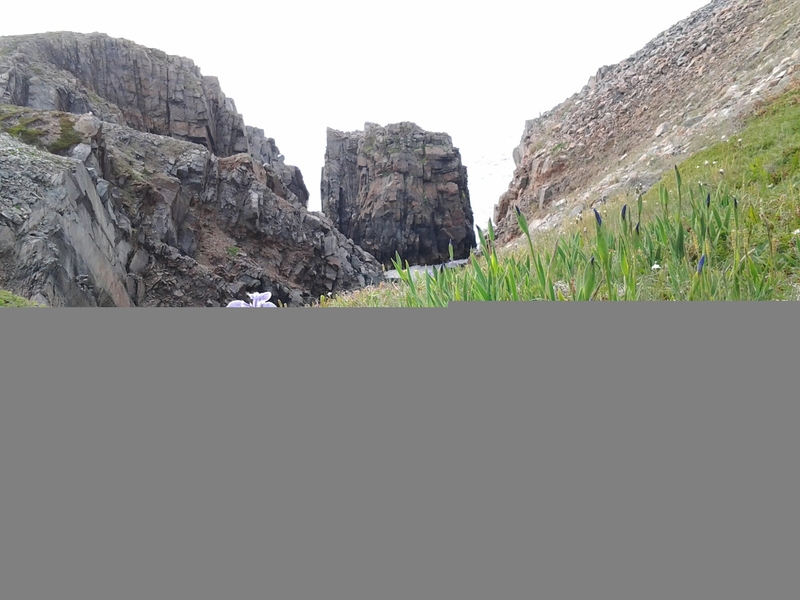 The remaining bergs were far out but still huge. 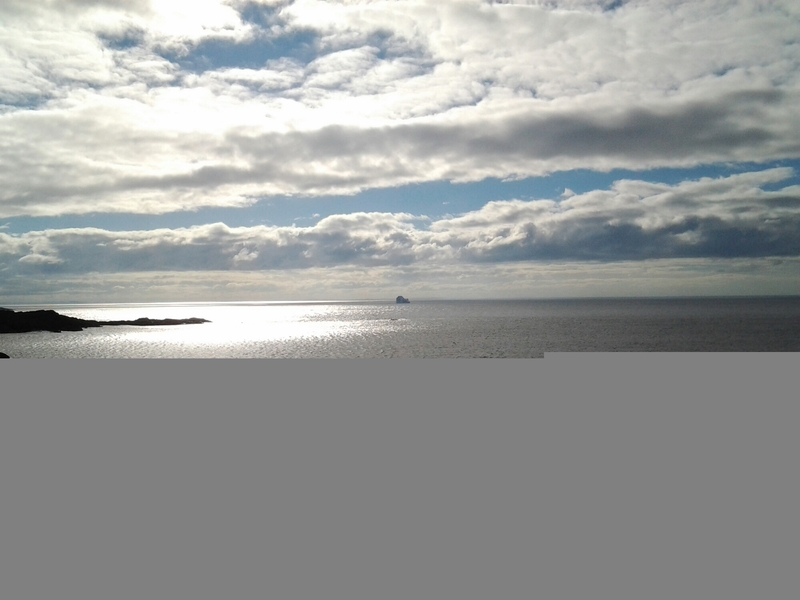 There was a ghostly shape in the far distance that would have been a superberg for sure. Working our way back to our Stagehead room we detoured to Keels, a favoured stop since we first discovered it about 16 years ago. 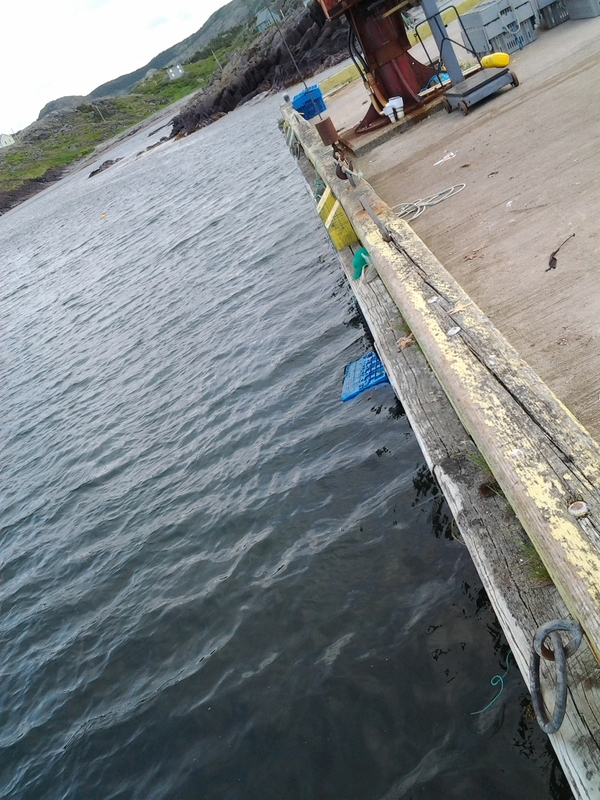 Keels continues to be a fishing outport with evidence of the lobster fishery and a box of lobsters just teasing us off the wharf. Mysteries and folklore abound in a place that has such a long history as ours. 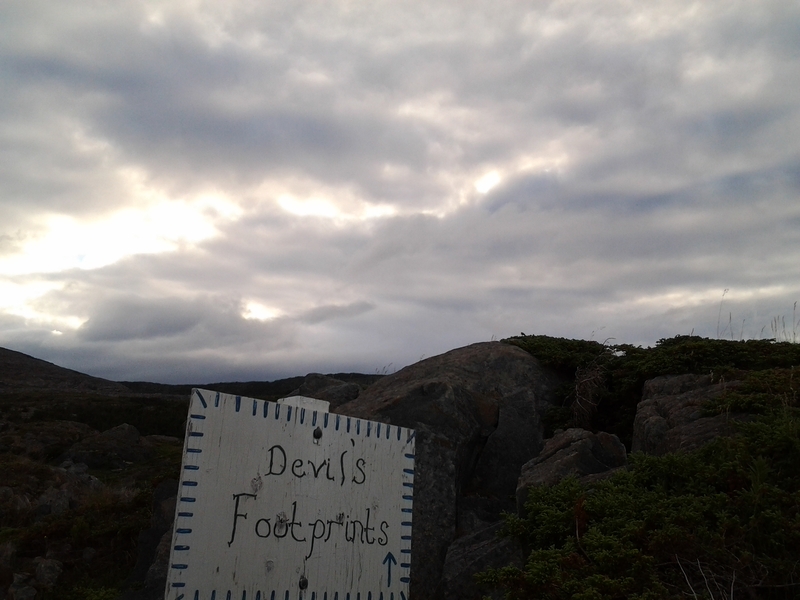 My favorite mystery is the origin of the Devil’s Footprints in Keels. 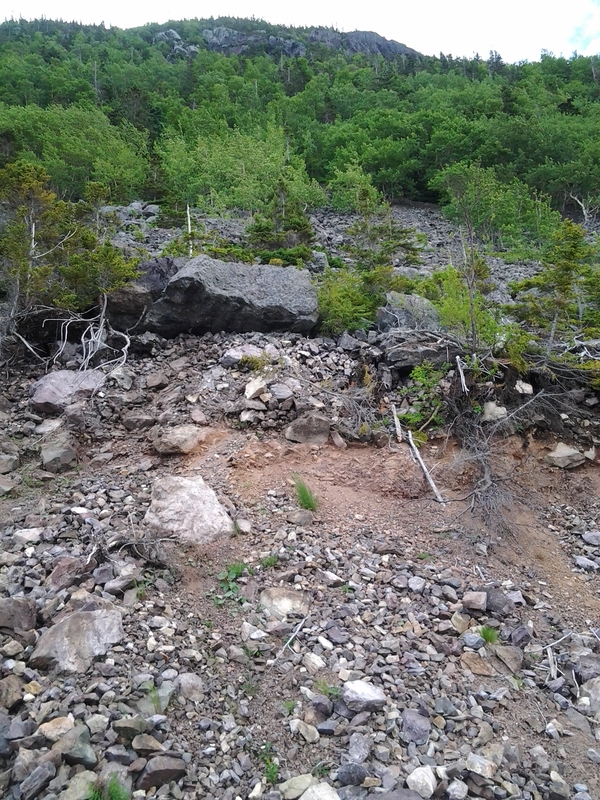 The tops of the rocks are getting grown over but the hoof-like prints are easily seen on the sides of the rocks and it’s quite easy to picture something running over the rocky hills leaving this track. Even more disturbing might be to wonder what on earth was chasing it! A lovely church was lit with an old light and I really wanted to knock and intrude to see what looks like a summer home in the restored building. Maybe next time. On our way back to the Stagehead room we saw some action at the wharf in Plate Cove East. 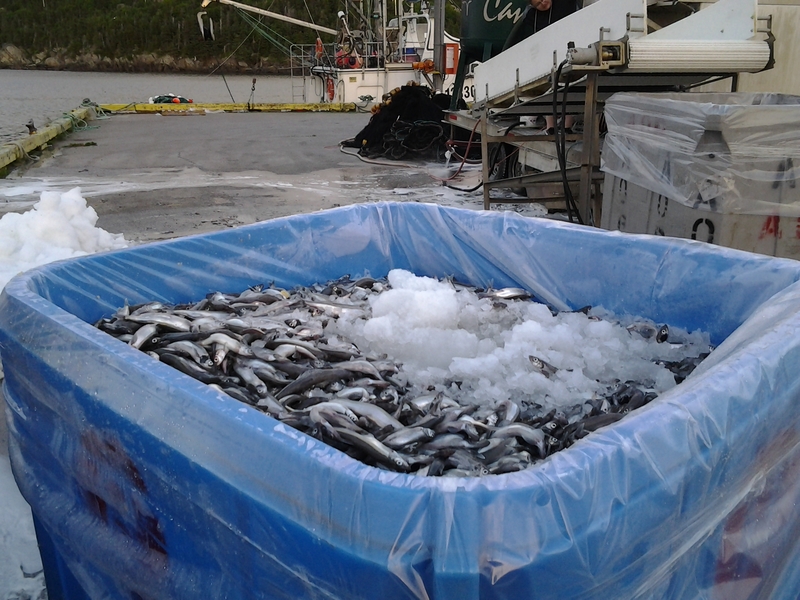 We took a spin in and watched capelin being off loaded into containers. Special thanks to the forklift driver for not running over me and suggesting I get a picture from the back of the boat. 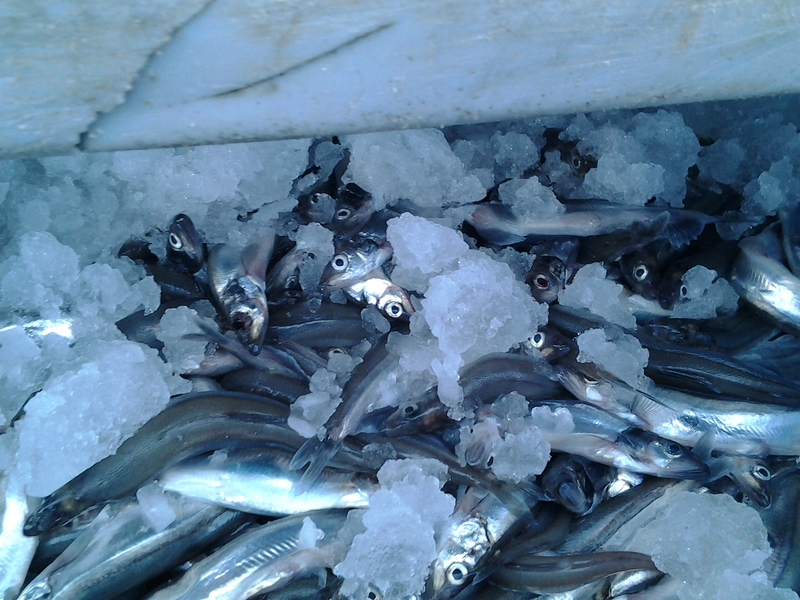 My sneakers will forever smell of capelin juice. 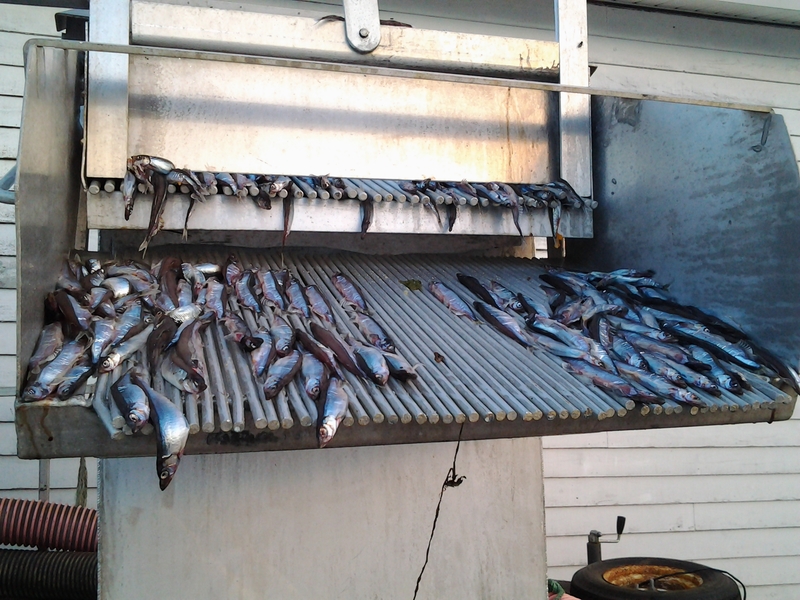 Not exactly the way I had hoped to see capelin rolling but maybe as close as I’d get for this year. Arriving after dining room hours, we checked in with Chris to ensure him we had returned. He just gave us a key earlier and took no deposit or card imprint. 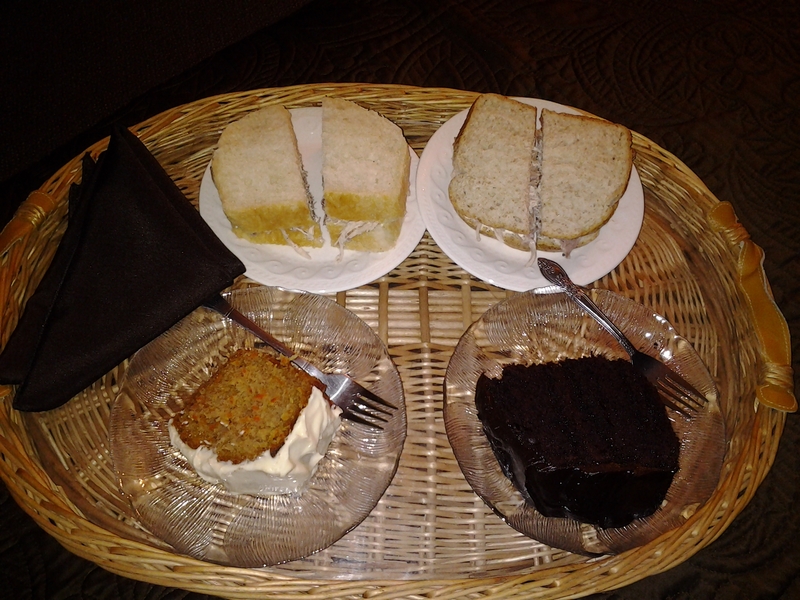 He asked if we’d eaten and eagerly made us a couple of turkey sandwiches and homemade desserts for our room. It was delicious and just right after our adventures of the day. After a great sleep we enjoyed breakfast with Karen’s homemade strawberry jam and got ready to hit the road. My Facebook friend Hilda had followed some of our pictures and suggested a trip to Open Hall, nearby, to meet photographer Paul Dolk. 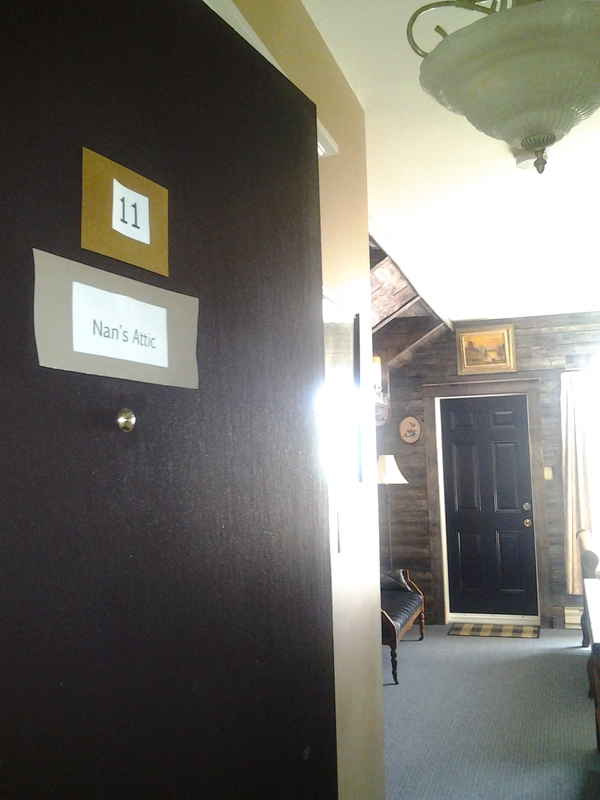 Ironically, as we were loading our car, I recognized him entering the Inn. After checking with Chris to be sure, I said hi and only add this to give readers an excuse to check out his photography and watch for videos taken with his newest toy, a drone camera. Icebergs and whales have never been so beautiful! Posts may slow down as travel increases. 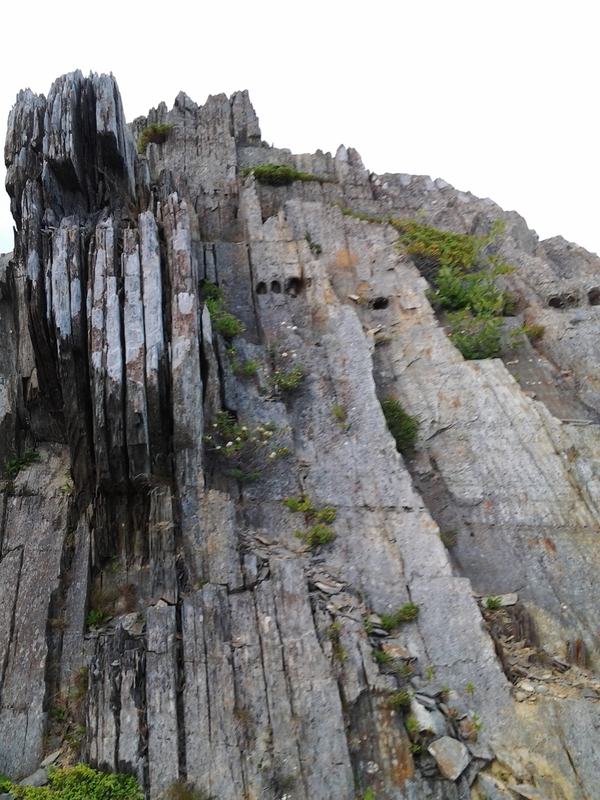 There are a lot of places to see in Newfoundland and Labrador and we have seen so many already this year.